Unikids (4 years–2nd grade) appreciate all the swing time they can get - and we love that our teens are ardent swing swingers! Galileans (3rd, 4th, and 5th grades) could go around and around and around on the merry-go-round incessantly. It's amazing that there is never a queasy stomach when the go-rounding is done! The Galileans are a service-oriented class. 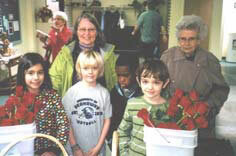 Alison Cantril, Mary Griggs, and the class take Valentine roses to the residents at Good Samaritan.